Proving the existence of a terrestrial plant species in an area is usually easier than proving the existence of a terrestrial animal species. The mammal, bird, reptile or amphibian will sometimes flee if approached, or might spend 95% of its lifetime (or 99.9% of its lifetime during daytime) down a hole in the ground. The plants are out there sitting in plain view and do not hide–although some annuals essentially disappear part of the year, and even some perennials cannot be assigned with certainty to a particular species unless their flower or seed can be examined. 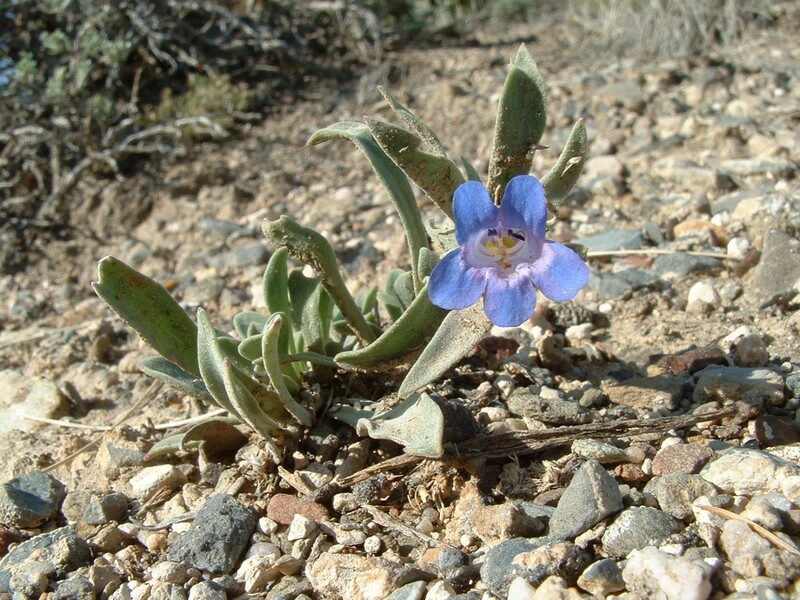 There are still plenty of cases in which the occurrence of a plant species in a particular mountain range or valley area has simply not yet been documented “according to science.” When I compare the current Utah State University digital database of Utah’s plants with my own observations, I can come up with a list plant species’ occurrences that that online database does not include. I’m posting this list here partly to demonstrate how our current, formal assessment of the ranges of Utah’s native plant species is somewhat incomplete. Asterisks next to names denote a photo in one of my previous posts here. Sorry for the disorganization of this post. I initially published it Feb 25, 2010; then added comments Aug 31, 2011; and now am adding additional comments Feb 21, 2013. One aspect of this post needs to be corrected now. P. leonardii var. leonardii and P. humilis seem now fairly easy for me to differentiate. 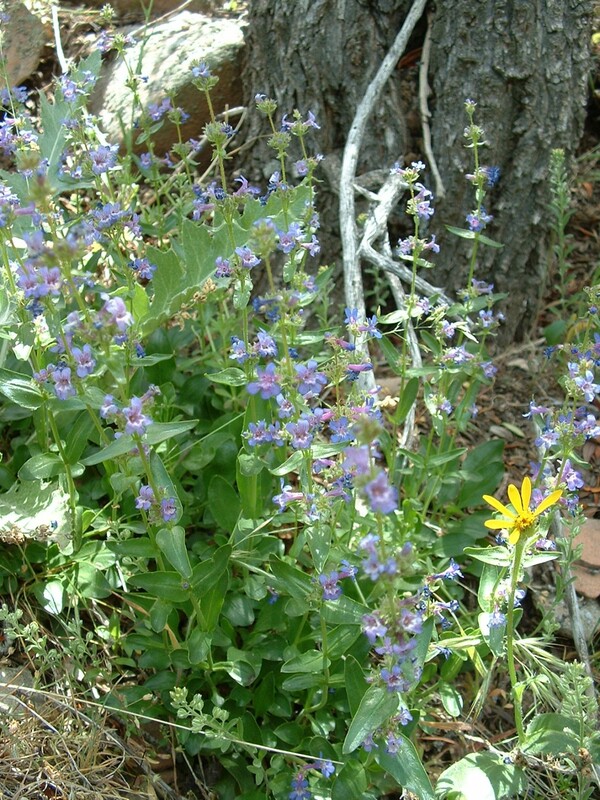 The former lacks the yellow-orange staminode (“beardtongue”) in the flower that P. humilis always possesses; it lacks the dark purplish guidelines inside the flower that P. humilis routinely possesses; and its leaves, including those most basal, are narrower & longer than those of P. humilis. 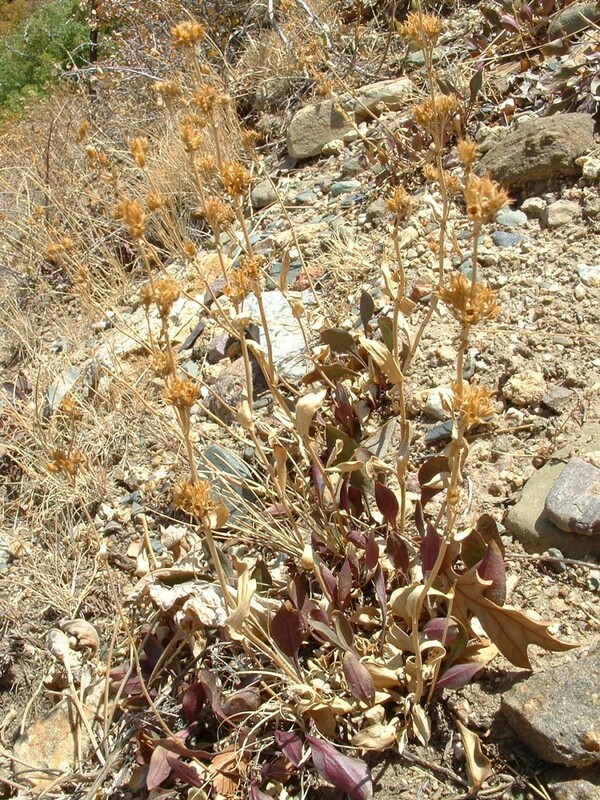 P. humilis is shorter-stemmed, with smaller flowers, and occurs at lower elevations. But P. humilis can occur in a fairly broad span of habitat types, and can appear variable in some respects. So, I’ve now fixed that early June 2007 P. humilis photo’s caption–and some related comments in the text among the photos below. 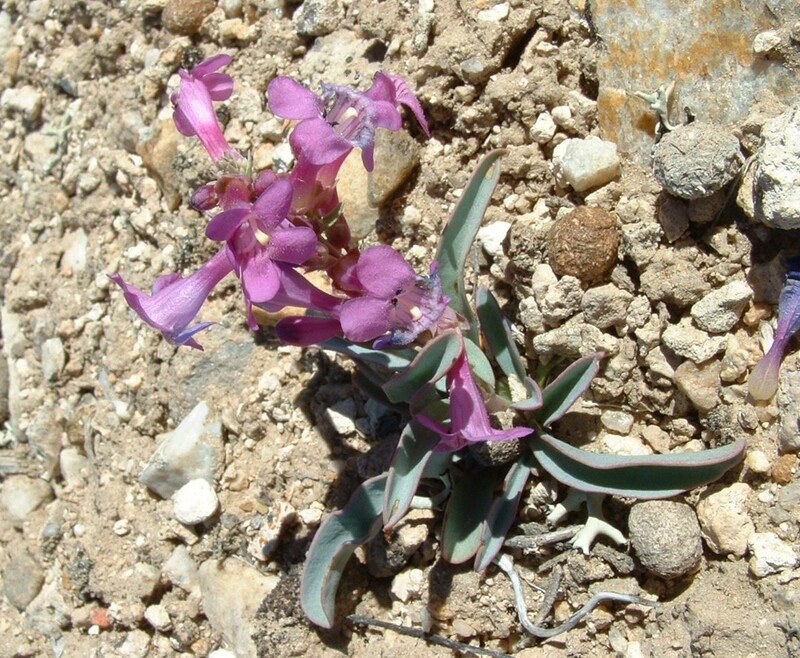 There are still “11 species” of Penstemon presented among this post’s photos, but there’s only one variant of P. leonardii here (not two)–P. leonardii var. patricus. In retrospect, I have some doubt about my identification of P. subglaber, below. The person I was with when we saw those plants was more knowledgeable than I, and deemed them subglaber; but I now feel less certain. True subglaber should be quite similar to cyananthus, I think. Also, as time has passed since this post I feel less certain of my ability to distinguish P. humilis from P. leonardii var. leonardii. If anyone can comment on these points, please do. More field observations have taught me that within-species morphological diversity can be greater than I had earlier presumed. At some point I hope to be able to confidently distinguish these four rather similar forms: leonardii var. leonardii vs. humilis vs. watsonii vs. rydbergii. Still, I do remain certain of all other species assignments below. 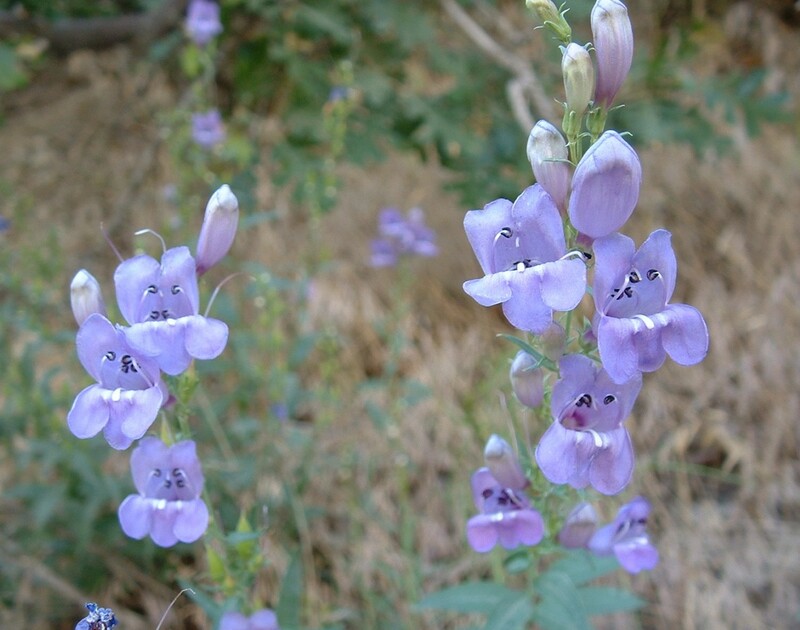 At some point I will make another post of more Penstemon photos, but that may be far away. 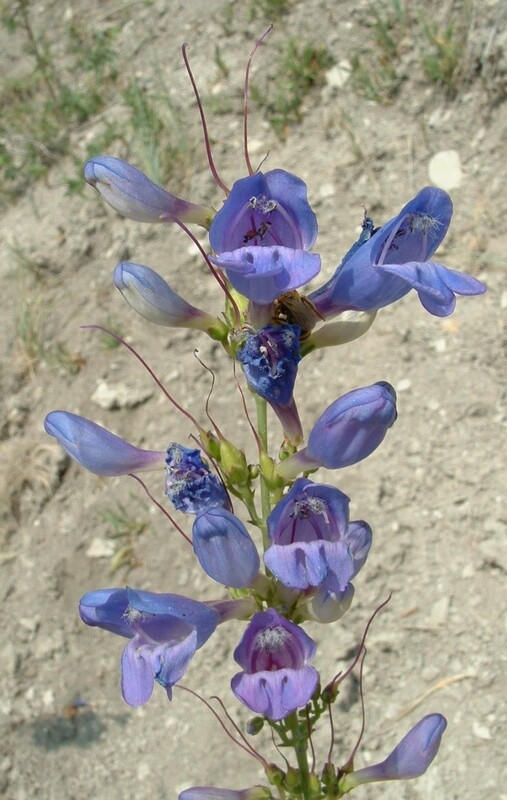 According to current taxonomy, the geunus Penstemon contains 66 different species (some of which include multiple variants or subspecies) that occur within the state of Utah. 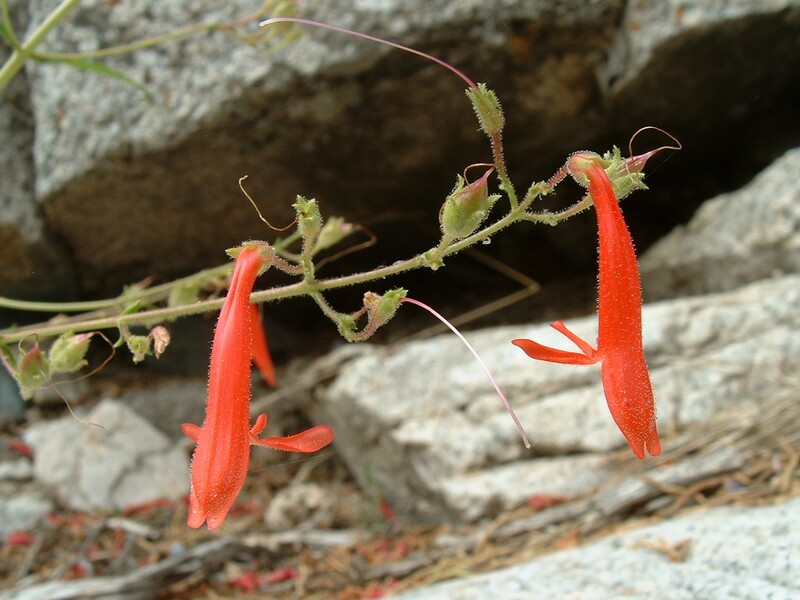 I did not include photos of Penstemon species in my previous “new plant species” posts, because I saved these photos from 2007-2009 for one post devoted to this genus. Similarly, some of my anticipated upcoming posts will also cover plant categories for which I have stockpiled photos that were left out of my previous posts. Those posts will be devoted to the genus Tetradymia (horsebrushes), the genus Physaria (bladderpods), and the genus Asclepias (milkweeds). 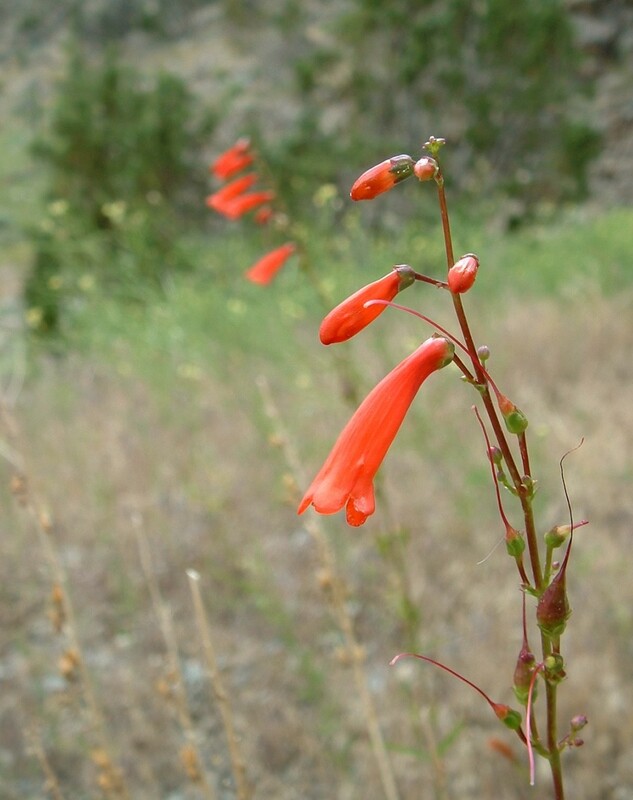 Here are some photos of 11 Penstemon species (the first of which includes two recognized variants) that I have learned to recognize and have photographed in flower. When I saw these during my summertime fieldwork with Red Butte’s conservation program, I brought back vouchers in peak flower and showed my supervisor Greg. Although he was familiar with the eastern variant of this species (var. 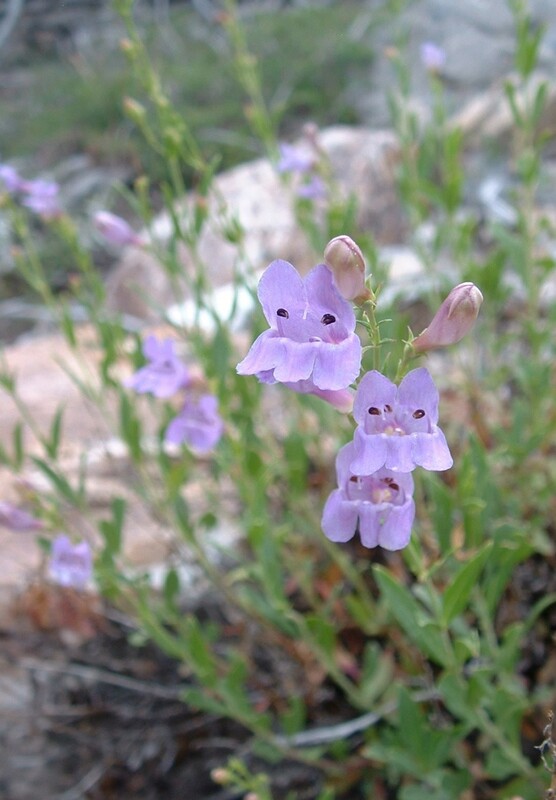 leonardii) that is common in the Wasatch Mtns, this Penstemon was so different, with its larger, lighter-colored more lavender flowers, he did not recognize it as being the same species. I spent the time keying this out in Welsh et al., and concluded it was P. leonardii var. patricus, after squinting at the morphology of the anthers. 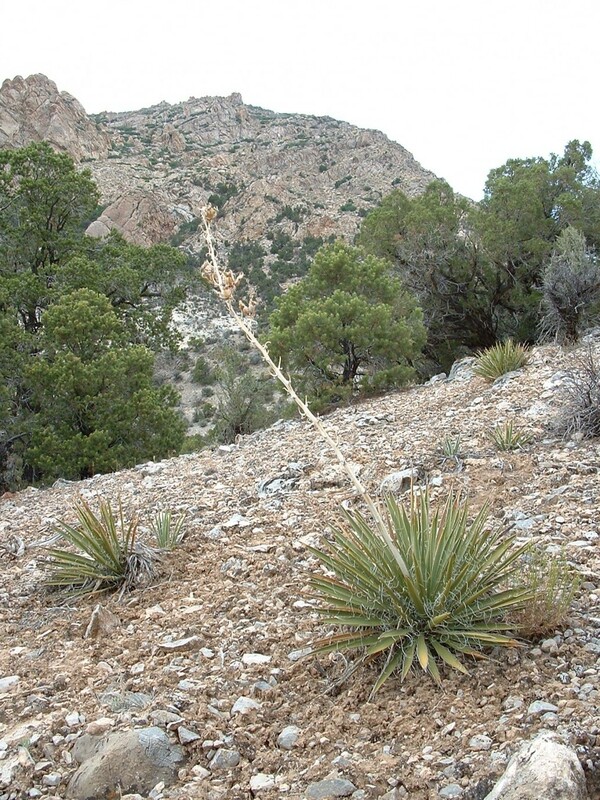 In the House Range here it grows at about 6,700-7,100 ft elevation, in pinion-juniper habitat, in both limestone and granite substrate. This is more of the same variant shown above, this time from the next mountain range to the west, the Deep Creeks. Supposedly these are the only two Utah ranges in which this P. leonardii variant occurs. There was a clear tendency for the var. patricus plants in the Deep Creeks to be shorter, with fewer and smaller flowers than in the House. That difference could be due to different years’ weather, or other factors–or maybe it is genetic? In both the House and the Deep Creeks, most places I have seen P. leonardii var. 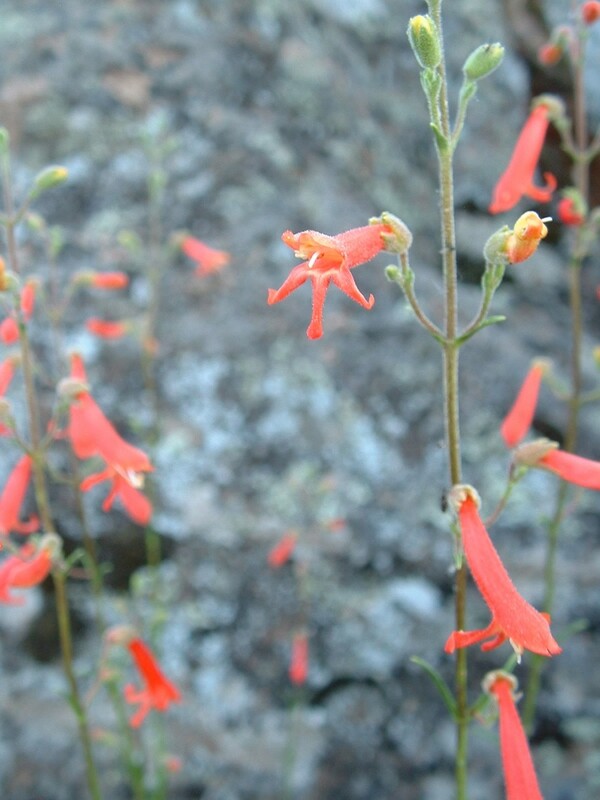 patricus I have seen two other Penstemon species nearby–P. eatonii and P. humilis. In the House there is a spot where the most of the P. eatonii seed bracts are infested with black beetles but the other two species’ are not. Welsh et al. claims P. leonardii that occurs in Millard County’s Canyon Mtns is intermediate between var. leonardii and var. patricus. So far I’ve seen no P. leonardii in that range, so cannot comment on that. 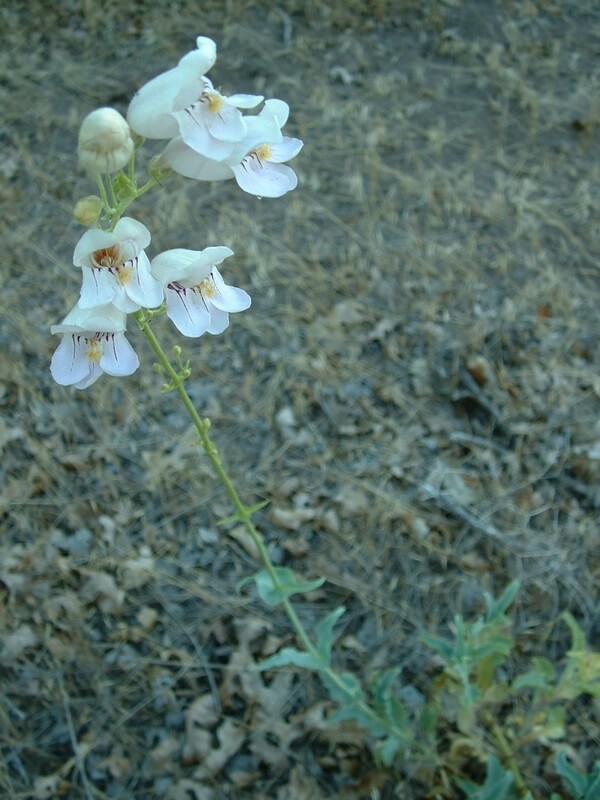 The trees in the photo’s background are Cercocarpus ledifolius–curlleaf mtn mahogany, in whose shade this Penstemon grows. Other species nearby here at ~7,250 ft are Quercus gambelii, Mahonia repens, and Cirsium sp. Initially when I published this post I believed this was P. leonardii var. leonardii. As I pointed out in this post’s supplementary comments, added at its top on Feb 21, 2013, I’ve later realized this is P. humilis–growing taller than usual here in this wetter & shadier spot than usual for most of the P. humilis I’ve seen. 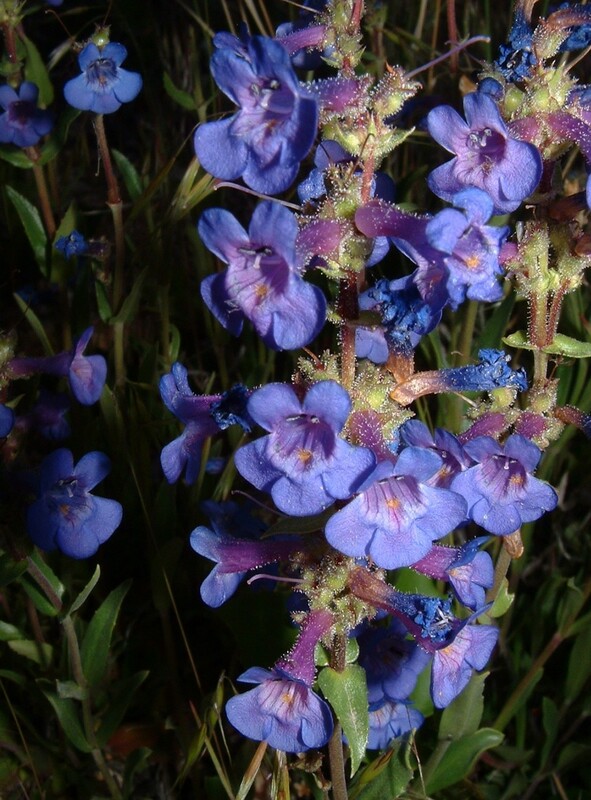 Prior to 2007, I think I could recognize this species and P. eatonii, but no other Penstemon species. P. palmeri has been seeded along Utah’s paved and dirt roads in places far north of its original range–such as in the Oquirrh Mtns. 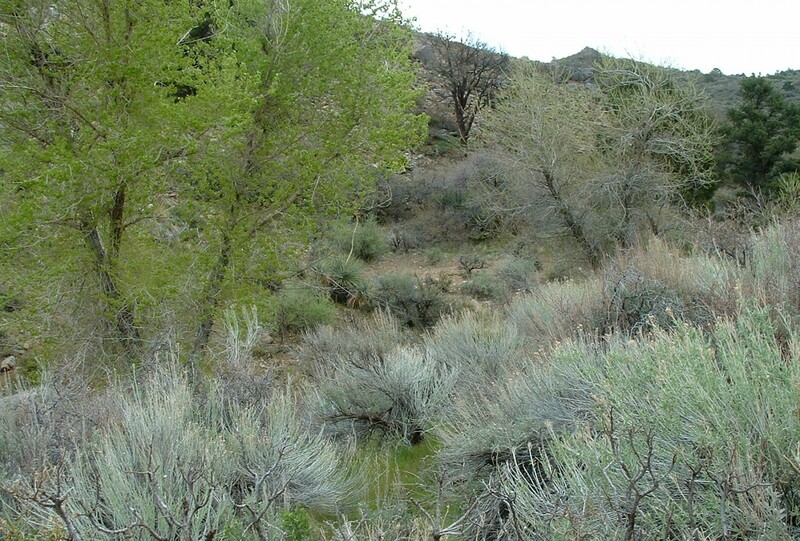 But, native P. palmeri such as this photo also occur sprinkled in pinion-juniper habitat almost a mile from any road. This photo turned out nicely, before I knew what species this is. 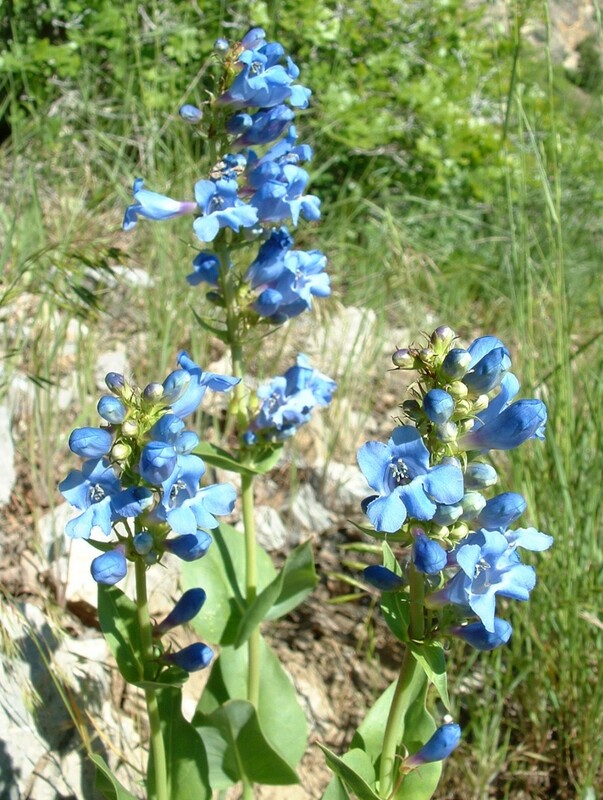 In Utah’s Iron and Washington Counties, I have seen this species continuing to bloom through at least mid-August, which is later than most other Penstemon species. Here, P. rostriflorus grows near a small spring in pinion-juniper habitat, right alongside Mimulus guttatus (seep monkeyflower). Most places P. rostriflorus occurs are not right near water. I have only seen this species once, here at ~8,7oo ft elevation in the Unita Mtns. Here it grows near Pseudotsuga menziesii, Linim kingii, Chaenactis sp., and two other Penstemon species–eatonii and pachyphyllus. 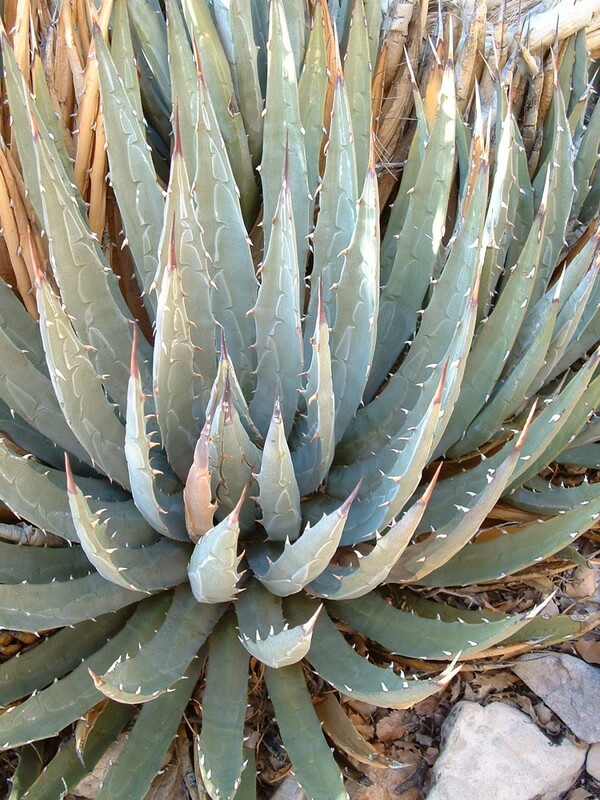 Notice the serrated leaves. 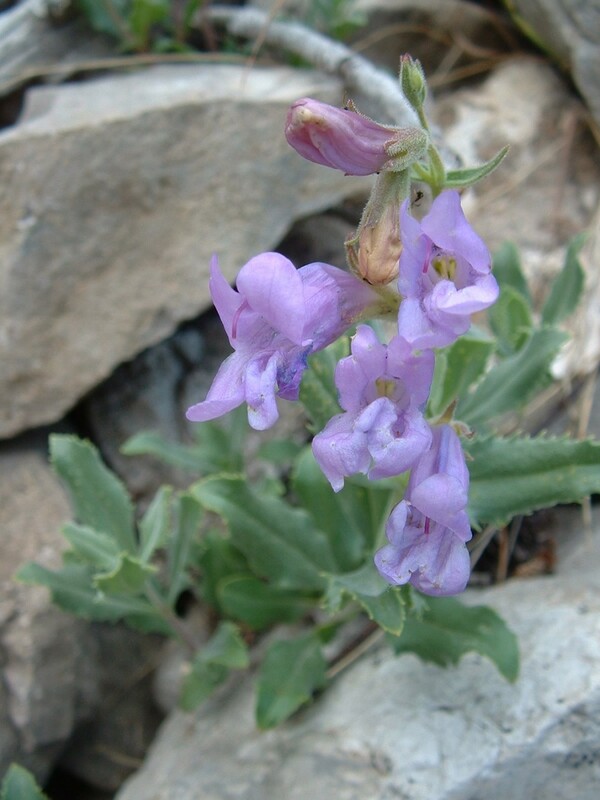 On a different visit to the Uintas, we came across three small patches of this Penstemon, growing out of rocks on a steep slope, along a dirt road near Picea engelmannii, near 9,500 ft elevation. Penstemon whippleanus flowers at the same time and grows along the same slope, not far away, in an area a bit higher, wetter, flatter and less rocky. Unfortunately I did not bother to photograph P. whippleanus during this visit, and have not seen it since–and its plants I saw here were of the striking dark purple-flowered version, with flowers so dark they are more black than purple. 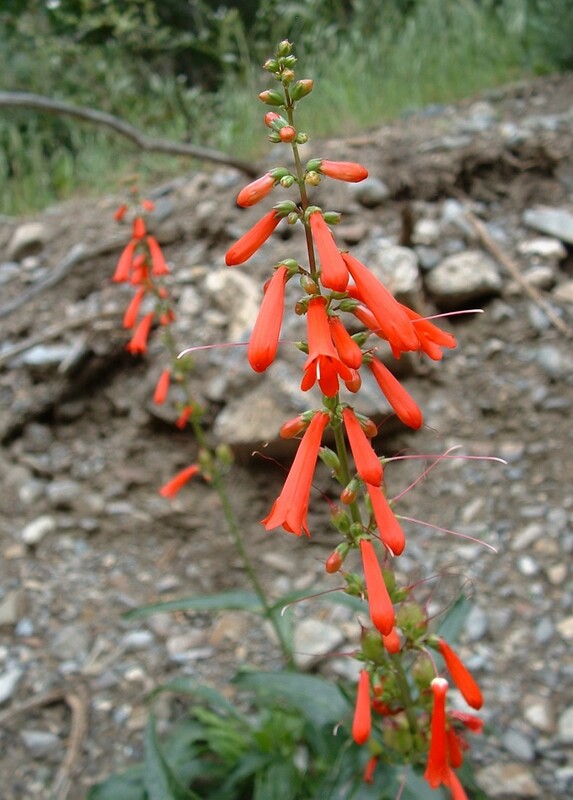 Finally in 2009 I figured out what this Penstemon species is. I have seen it in pinion-juniper habitat at least four sites in Utah’s Iron and Beaver Counties, but at those places I have never seen it in flower. This species finishes flowering early. 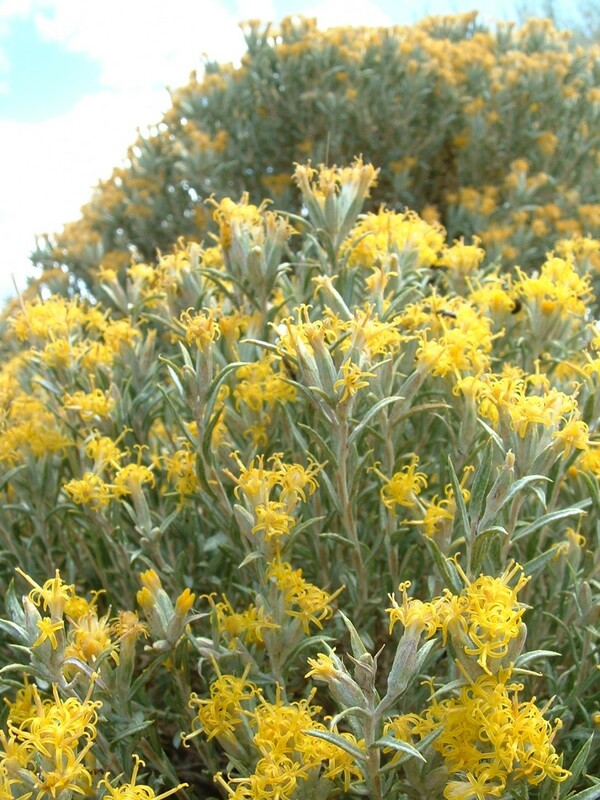 Once, here in eastern Nevada, I snapped a photo of it flowering in May. I think a noteworthy characteristic of this species, evident in this photo, is its pinkish/reddish edge of the leaves; but none of the species descriptions I have read mention that characteristic that seems to separate it from other Penstemons. Most of the time I have seen P. confusus, it looks similar to the photo above. 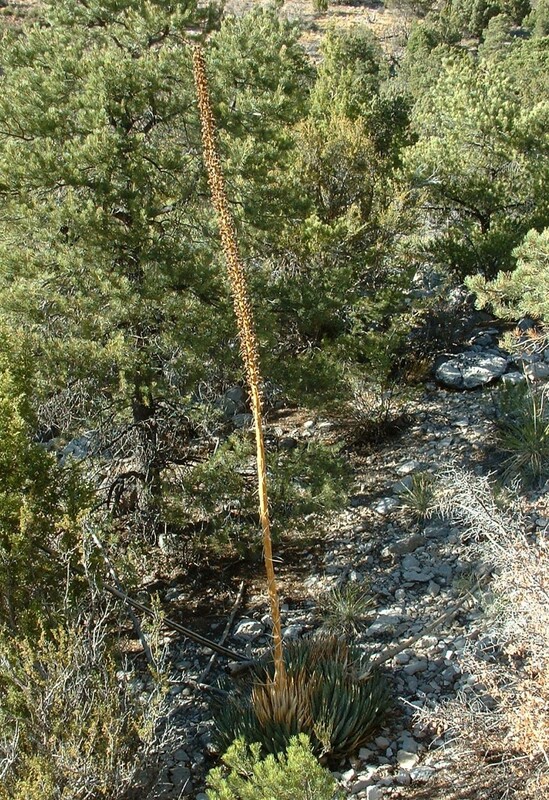 This species tends to have taller flower stalks when it grows in partial shade, and shorter stalks in greater sun. P. confusus has fewer but larger seeds than those of other Penstemon species I have examined. Here in the Wasatch Mtns, P. cyananthus grows amid Quercus gambelii. Actually, at this site there is a broad slope of low-growing Quercus gambelii that the P. cyananthus occurs within and protrudes above. At six of the seven sites I have seen P. platyphyllus, I have also seen P. cyananthus nearby. 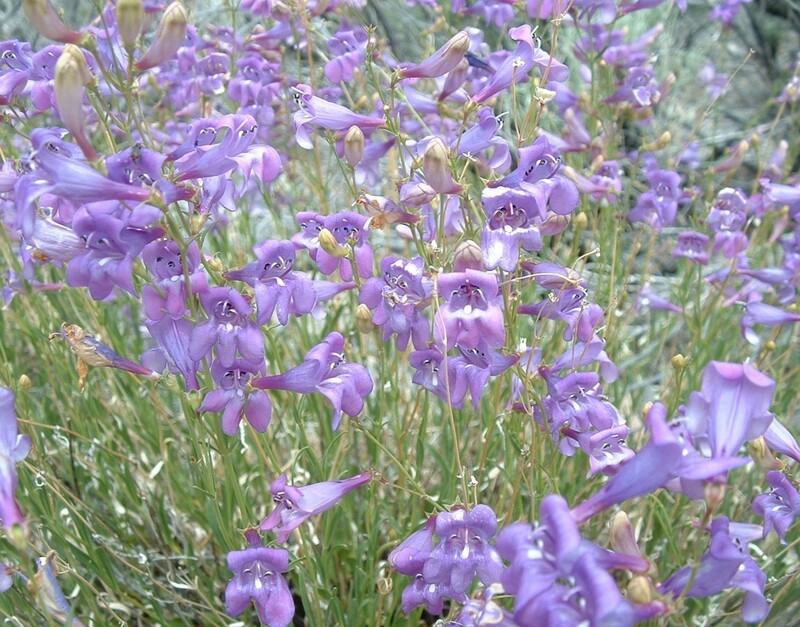 In the Wasatch, both of these species grow at elevations a bit lower than P. leonardii var. leonardii. When in flower, the easy difference between P. leonardii var. leonardii and P. humilis is P. humils flowers have a gold-bearded staminode (visible in this photo) that P. leonardii lacks. 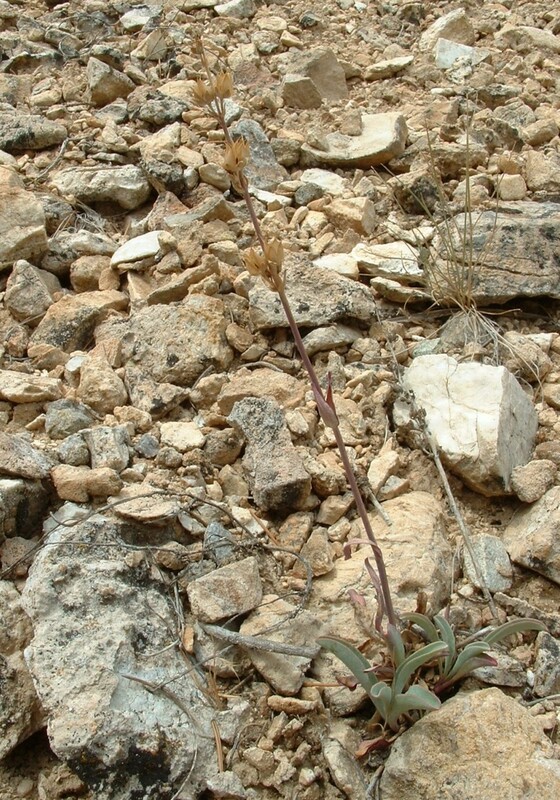 Here, P. humilis grows near P. cyananthus. Most of the time I have noticed P. humilis it has been past flowering and has looked something like this, and I have not been certain it was not P. leonardii var. leonardii. But this was near the site of my photo above of the late May 2009 flowering P. humilis, so I am pretty sure it is P. humilis. Finding this species was a surprise. I only found a two plants, and only this one flower, growing in pinion-juniper-big sagebrush habitat around 5,900 ft elevation. This species’ leaves seem a surprisingly good mimic of those of a Cryptantha sp. that is common here. After years of poor photos, I finally obtained decent photos of this very wide-ranging species. 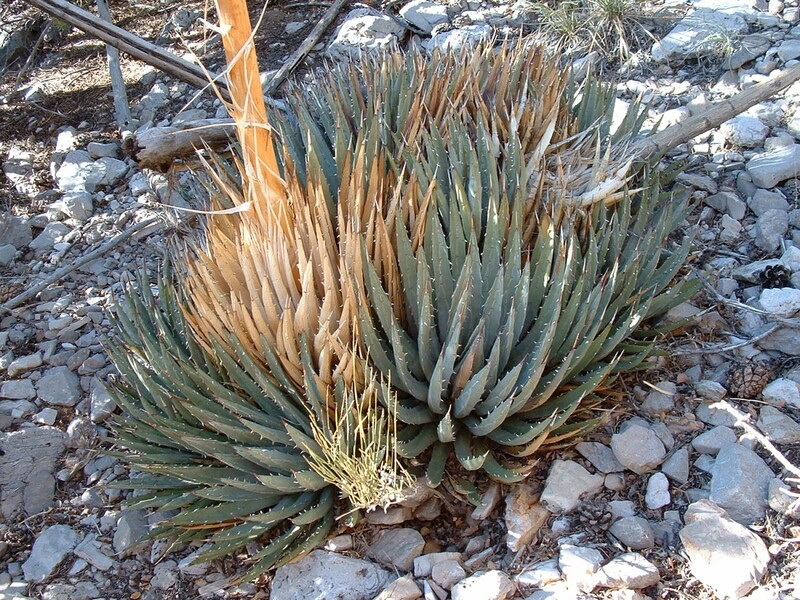 These grow around 6,600 ft elevation in a dry wash. I took other photos of P. eatonii at this site, and include this additional one that turned out well. Notice some of last year’s brown P. eatonii flower stalks, in this photo’s background. Maybe I can come up with photos of some of these species and post them in the future? These are photos of more plant species I learned to identify and first took decent photos of during 2009. I have split this category into two posts. Part 1 was posted earlier. This is my best photo so far of this very common yucca. These grow here in gaps in the pinion pines. Associated plant species here include Pinus monophylla, Juniperus osteosperma, Cercocarpus intricatus, Ephedra viridis, Purshia stansburiana and Gutierrezia sarothrae. In this habitat I found both lizard species: Sceloporus occidentalis and Sceloporus graciosus. The photo below is a close-up of the terminal seed head above. Near dusk, it was growing darker and the wind was gusting. Five of these black and yellow wasps were jostling to fit in the windblown shelter of this old seed head. Apparently this is a wasp species that does not gather in nests at this time of year? 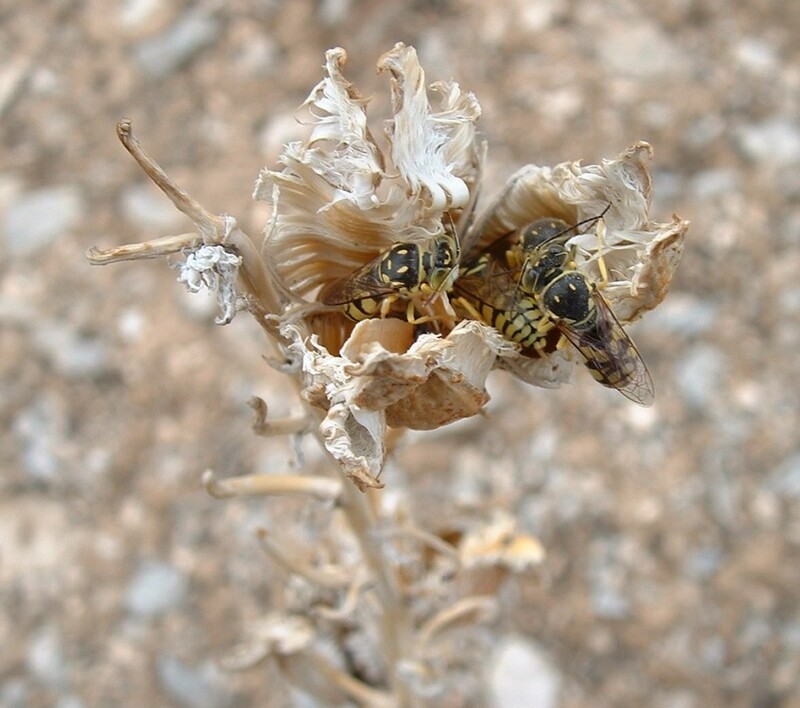 Apparently these five wasps were going to spend the night in this yucca seed head? How did this group find this shelter? When the first wasp found it, how did the other four join later? Is this group going to assemble in this same shelter the following night, too? As I continued uphill from this plant, I found 16 more sprinkled in an ~80m line extending uphill. The USU digital database currently lists the elevation range of this species as 970-1,520 meters. 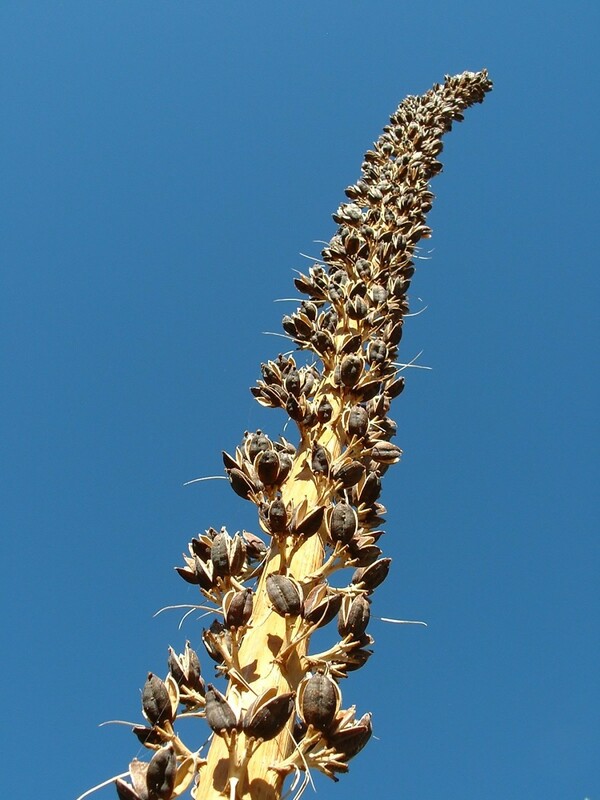 However, this big plant with its flower spike was at 5,755 ft (1,755 meters). I thought I had found a curious outlier. But later, I checked Welsh et al. and found that it states the elevation range as 1,000-2,015 meters. So, if the USU website and Welsh et al.’s book differ in their stated elevation ranges for a species, I will probably trust Welsh et al. Here is one live rosette at this plant’s base. This shot shows the base of the plant. When a flower spike extends from a rosette, then that rosette dies. This shot point up at the flower spike. At this time of year the seeds had dispersed. The other 16 plants of this species I noticed farther uphill did not have flower spikes from this season, although most showed the carcasses of previous seasons’ flower spikes. I thought I had noticed these hackberry trees in this Wasatch Mtns’ canyon a few years prior, and negotiated up the steep SE-facing slope to visit again on this last day of November. 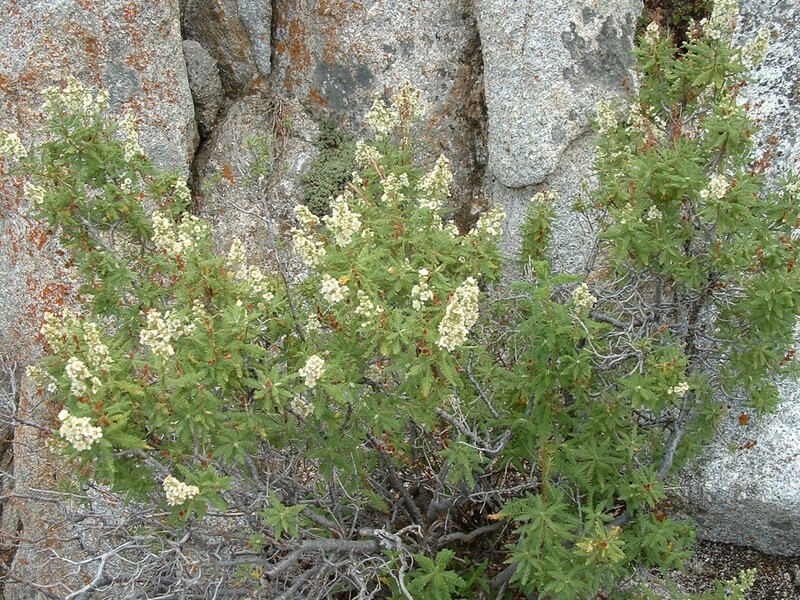 Here, they grow around 5,200 ft elevation, with Artemisia ludoviciana, Rhus trilobata, Purshia stansburiana, and Eriogonum brevicaule, not far from Quercus gambelii. I seldom see this species, and this site is the only place I have noticed so far where the species grows a long way from water. 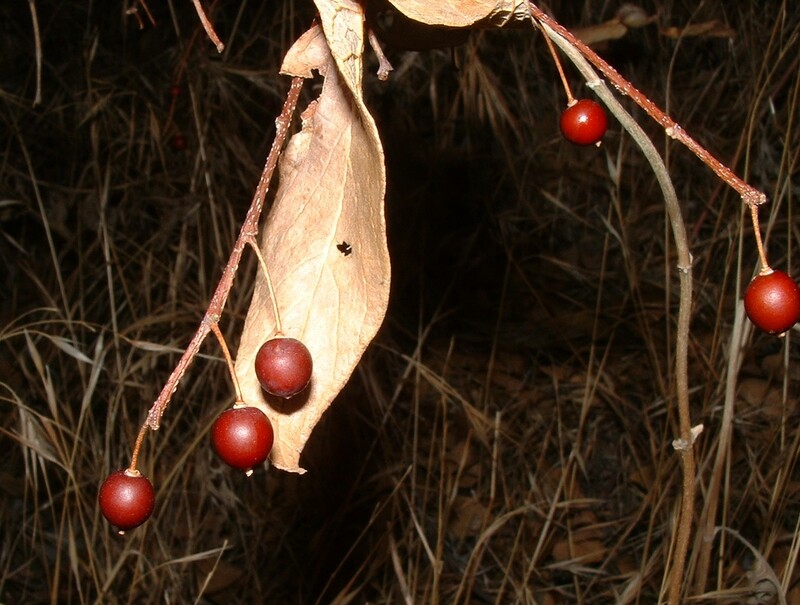 Some of its red berries remained, close to the ground and facing generally south. I suppose the birds had taken the higher ones. The drying flesh of the berries tasted good to me. Coyotes and foxes supposedly utilize them as food, too. If hackberry trees can grow in such a dry place as this, amid cliffrose, then I would expect them to have good potential as a drought-tolerant tree for greater use in horticulture. 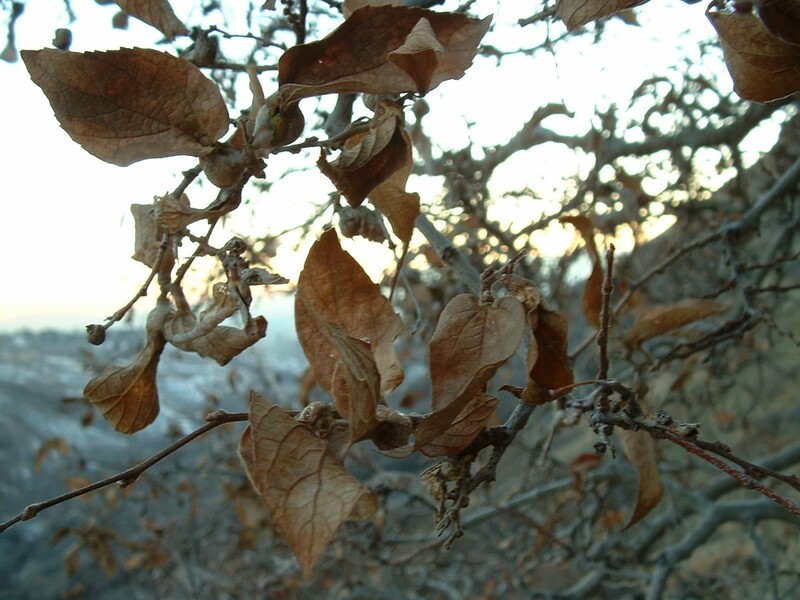 However, only once do I think I’ve noticed hackberry used in horticulture–in a park area (that was not so dry) in the Provo Canyon area of Utah County, Utah. This species’ name has just recently been shifted from C. reticulata to C. laevigata (var. reticulata). There is a fun, disheveled playfulness in the branching pattern and general appearance of this tree species. The many knobs of galls on the recent stems add to its special look. It is easy to differentiate from all other trees in this area. It is the only native Elm Family tree here. The most similar species are nonnative elms (Ulmus sps. ), but they are more regular-looking, and have samaras (winged seeds) rather than red berries. 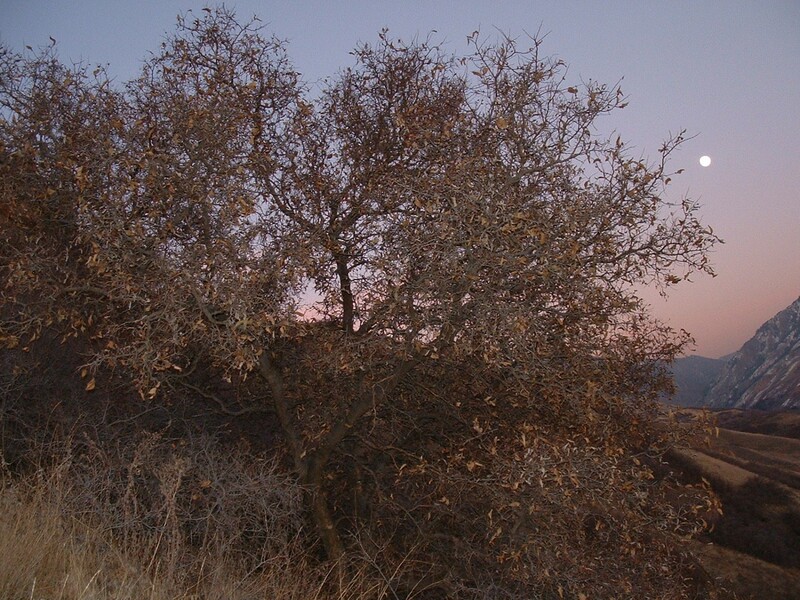 Here is one of these dry-slope netleaf hackberry trees at moonrise. I was surprised this shot came out as well as it did, despite my camera’s limited abilities and the darkness at the time.